Liposomal vaginal drug delivery systems are important strategy in the treatment of both topical and systemic diseases. The aim of this study was to develop a vaginal delivery system for benzydamine hydrochloride (BNZ) loaded liposomes dispersed into mucoadhesive gels. The delivery system was also designed for a once a day dosage and to obtain controlled release of the BNZ. For this purpose BNZ containing gel formulations using hydroxypropyl methylcellulose (HPMC) K100M and Carbopol® 974P, which are composed of polymers that show promising potential as mucoadhesive vaginal delivery systems, were developed. In addition, a BNZ containing liposome formulation was developed for vaginal administration. To improve the vaginal retention time, liposome was incorporated in HPMC K100M and Carbopol® 974P gel formulations. This system is called lipogel. The developed BNZ liposomes have a slightly negative zeta potential (−1.50±0.16 mV), a 2.25±0.009 µm particle size and a 34% entrapment efficiency. These gels and lipogels have appropriate pH, viscosity, textural properties and mucoadhesive value for vaginal administration. 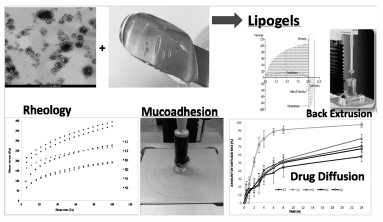 Lipogels were found to be the best formulations for in vitro diffusion and ex vivo mucoadhesion. The work of mucoadhesion obtained from liposomes was in the range of 0.027±0.045 and 0.030±0.017 mJ/cm2, while the value obtained from lipogels was between 0.176±0.037 and 0.243±0.53 mJ/cm2. N1 and N2 lipogel formulations diffused 57 and 67% of BNZ respectively at the end of 24 h. Moreover, a higher mucoadhesion, which increases drug residence time in comparison to liposomes, could improve BNZ efficacy. In conclusion, BNZ mucoadhesive vaginal lipogel formulations can be promising alternatives to traditional dosage forms for vaginal topical therapy.